An understated ballet flat hand-crafted from rich and supple leathers. I now have 3 pair and love them!!!!! Perfect to wear all day on the first day. I wear 9.5 W and just wish I could find the black ones in my size. A super comfortable shoe that looks great! It really well with just about anything , but really looks great with skirts that have a blue stripe. The picture doesn’t do it justice- the blue leather is gorgeous. I love Born Juliannes! 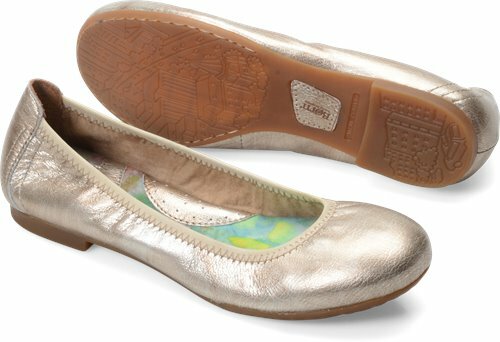 I have several pair as they are the most comfortable and classic ballet flat. The elastic is just right and does not dig into ankle. The more you wear them, the more they soften and mold to your feet. I still have pairs I purchased several years ago and they polish up like new. So soft and comfy! Arrived very quickly, true to size and even better color in person. So comfortable right away. I love these shoes! Very comfortable. I plan on ordering another pair in a different color. Love my Born shoes and will use Shoeline again. I'm happy with this purchase. I wear a size 7 or 7 and a half. When I have to go up half a size, it's generally because of the width. I bought the size 7 in these shoes. They're a bit tight across the toes, but that's the fault of my bunions, not the shoes. They seemed to stretch as I wore them for the first time, so I think they'll be fine. I got them in silver, but the color looks sort of gold. Anyway, it's shiny and pretty and I'm not complaining. I bought these for my mom. She loves them and said they are the most comfortable shoes!! These shoes are nice and soft leather, comfy right out of the box. They are just what I was looking for in a well-made ballet flat. These are a very nice simple pair of flats that are perfect for daily errands and chores when you still want to look nice. Very comfortable and well made. Shipped fast. Love the free shipping. Beautiful shoes. Simple but look so nice with my new pair of jeans. The comfort is spectacular. Good service too.